Meeting to coordinate strategy against Nazi Germany at which it was determined that Stalin would retain the Baltic states as well as gain Polish and Romanian territory. Roosevelt acceded to many of Stalin's demands, to the somewhat detriment of Churchill, in an attempt to gain Soviet favour for the war in the Pacific. Summit meeting of the Big Three, which is often said to mark the highest point in international cooperation between the three nations. Postwar issues were discussed, primarily the division of Germany, though specifications of war reparations were left to be decided at the next meeting. Free, democratic elections for countries liberated from the Nazis were agreed upon as were the borders of Poland. The decision at Yalta also sanctioned the creation of the UN and it was set that Russia would join the war in the Pacific following the defeat of Germany. First summit meeting after Roosevelt's death in which decisions were made regarding the actual implementation of agreements at Yalta. Further decision on occupation of Germany and war reparations had been stalled by Roosevelt in hopes of reaching compromise after the heat of the issues had cooled off, but Truman's hard line against the Soviets was in direct opposition to Roosevelt's more conciliatory policies. Thus this conference marks one of the early ideological conflicts of the Cold War. A Council of Foreign ministers was established to deal with peace treaties. The standard for American Cold War policy was set by the Truman Doctrine in 1947. It stressed the dangerous expansionism of the USSR and pledged support for "free peoples" around the world and those who were struggling against communism. It was prompted by the British withdrawal of forces in Greece and Turkey and was aimed at the containment of Communism even through, to some extent, military means. The Marshall Plan was a way to restore capitalism in Europe by providing dollar loans to non-communist states. This helped prevent a post-war depression as well as ensuring American dominance in the European economic sector. Restoring economic stability was seen as a key way of containing Communism; part of the thinking was that states prosperous under a free market system were unlikely to view Communism as an attractive alternative. Tito starts idea of non-alignment by having a Communist government that is separate from the Soviets. 12 May 1949, after the West had agreed to a reconvening of the Council of Foreign Ministers to discuss the "German question" post-establishment of the FRG Basic Law (8 May 1949). France, Britain, and Israel attack Egypt. -Reformist Communist Imre Nagy is brought back as Prime Minister in a popular uprising. Just before a summit meeting to take place in Paris, the Soviets shot down one of the American U-2 spy planes. Khruschev denounced American aggression and threatened to retaliate in Norway, Pakistan, and Turkey where other U-2's were based. 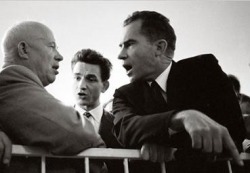 Following the hostile summit, US-USSR relations were frozen for the remainder of Eisenhower's term. October 16-28: Khruschev placed nuclear missiles in Cuba in an attempt to counter US numerical superiority. Of course, he claimed that it was to prevent an American invasion and was thus defensive action. President Kennedy decided on 22 October that the best course of action would be to place a blockade around the island, relying on the belief that the missiles were not yet operational and equipment was still in the process of being sent to Cuba. Six days later the Soviets agreed to remove the weapons and it is now known that Kennedy had entered into a secret agreement to not invade Cuba. Often called the beginning of the end of the Cold War. Alleged attack by the North Vietnamese on the destroyers USS Maddox and USS Turner Joy on 2 and 4 August of 1964. Leads to increased American involvement in the Vietnam War. Dubcek started a programme of political reform in the Spring of 1968 and installed more personal freedoms in Czechoslovakia, but this only lasted for a very brief period of time as he was arrested in August and 650,000 Soviet troops occupied the country to bring it back to Soviet Communism. Soviet foreign policy justifying the invasion of Czechoslovakia under the Warsaw Pact. It stated that the Communist parties were to have dominance in their respective states –under leaders approved in Moscow. If these conditions were put in jeopardy, neighboring socialist states were obligated to intervene. The PRC labeled this as imperialism. The Brezhnev Doctrine was loosened under Gorbachev to allow for his reforms. It was eventually dropped all together on 25 October 1989. The direction of foreign policy adopted by the Federal Republic of East Germany in 1969 aimed at improving relations with Eastern Europe. It reversed the Hallstein Doctrine under which the FRG refused to have diplomatic relations with any state that recognized the GDR. "Ostpolitik" became official FRG policy in 1969 and in addition to increasing trade opportunities it was to reduce the reliance on US military aid. Signed by Nixon and Brezhnev, set limits for each country's ballistic missile defense and froze deployment of ICBM launchers. The ABM Treaty constrains strategic defenses to a total of 200 launchers and interceptors, 100 at each of two widely separated deployment areas. These restrictions are intended to prevent the establishment of a nationwide defense or the creation of a base for deploying such a defense. The treaty also codifies the principle of "non-interference" by one party with the national technical means of verification of the other, thereby protecting the right of overflight by reconnaissance satellites. This becomes obsolete quickly as technological advancements made Anti-Balistic Missiles themselves obsolete. MIRVs increased the chances of being able to destroy the other side's strategic force and thus that side's ability to retaliate following an attack. -advance notification of large-scale military manœuvres. Iranian Revolution outs the Shah, a US ally. Signed by Carter and Brezhnev. Limited the number of strategic missile launchers and other such systems that each country could deploy. Even though SALT II was never actually ratified by the US Senate, it was generally adhered to by both countries. Created in response to events in Afghanistan, Carter moves toward a policy of "mobile response." "any attempt by any outside force to gain control of the Persian Gulf region will be regarded as an assault on the vital interests of the USA and such an assault will be repelled by any means necessary." Anti-communist trade union started in Poland. Development of IBM Defense systems that will be deployed from Outer Space to destroy Soviet missiles in flight. US offers to cancel planned deployment of Pershing II IRBMs and Tomahawk cruise missiles if the Soviets dismantle all intermediate range missiles in Europe and elsewhere. Soviets reject this because they *just* deployed SS-20s and it would also still leave US forward-based systems and the nuclear forces of France and Great Britain. US invades Grenada after the New JEWEL Movement's (somewhat Marxist-Leninist) leader is assassinated. JEWEL had planned on building an airport to help with tourism, but US viewed this as a threat because it would be used by Cuba and the USSR as well, in exchange for financial aid. The US holds elections, but the action was condemned by the UN. Gorbachev comes to power (March) and launches Glasnost (open debate on government policies) and Perestroika (economic restructuring). Realizes that military spending is crippling the Soviet economy, so he works hard at getting arms control so that he can go on with plans to restore the economy. Reagan administration uses profits from illegal sale of arms in Iran to secretly fund Contras. Exposed in 1986. Reagan not incriminated but many of his top aides resign and are later convicted. Gorbachev accepts the 1981 "zero option" (intermediate range) and proposes "double zero" (short range). NATO doctrine of "strategic nuclear deterrence." The goal was to intimidate the Soviets into not using their conventional forces in Europe, which greatly outnumbered those of the West and thus the United States would no longer need to maintain, at great monetary cost, their conventional forces to such an extent. This was essentially identical to Eisenhower's "New Look" defense strategy. Educational reform, housing reform aid to cities, immigration reform are all defeated. Keynesian economic strategy of tax cuts with deficit spending - never cleared congress. "Assured Destruction" developed as numbers of Soviet nuclear weapons increased greatly. The idea was that numerical superiority was not as important as convincing the Soviets of American intent to use nuclear weapons as direct retaliation. 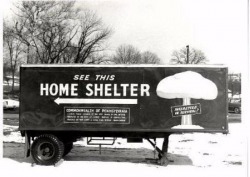 It was given the name "Mutual Assured Destruction" (MAD) by skeptics who found it unlikely that this would scare the Soviets so much that they would not proclaim the same. MAD, did, nevertheless, become the basis for limiting strategic weapons. After all, only a few nuclear weapons are necessary to cause unthinkable damage. Increase in the Defense Budget by 13% or $6 billion! March 1961: Kennedy planned this ten-year program to promote social reform, economic progress and democracy through unity among the Americas. More than $22 billion was given in aid to Latin America. Per capita economic growth was about 2.1% a year and increased to 3.7% through the 1960's. The social and (especially) political reforms were not successful and the 1960's saw many military coups, which the US supported as long as they were anti-communist, even if they were not at all democratic. 1 March, 1961: Established through Executive Order 10924 and authorized by Congress on 22 September. The goal as stated in the Peace Corps Act was to "promote world peace and friendship" and in so doing "help the peoples of [foreign] countries and areas in meeting their needs for trained manpower."